Fast-growing and hardy, tilapia is environment friendly and easy to grow for both small- and large-scale farmers. It is affordable and helps resource-poor consumers meet their nutritional requirements, especially in developing countries. Tilapia is the second-most farm-raised fish in the world after carp. Algae or other plant-based fish food can be used for tilapia farming, making it a sustainable alternative to fragile wild fish stocks and farmed fish that require animal protein based feed. Tilapia farming on a mostly vegetarian diet also reduces the cost of farming for aquaculture producers. Tilapia quickly adapts to changing environments including fresh or brackish water, enabling farmers to produce them in different farming systems. When steamed, grilled or poached tilapia is a good source of protein, nutrients and essential fatty acids. Tilapia has a higher amount of omega-3 fatty acids than other meats including chicken, pork and beef. Omega-3 fatty acids are important for brain function as well as growth and development. 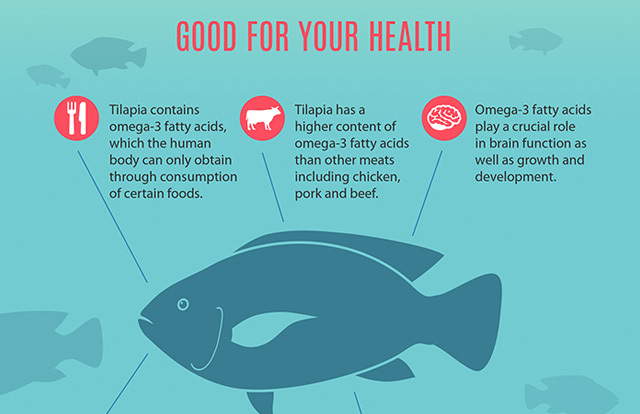 Wild tilapia has a higher amount of omega-3 fatty acids than farmed tilapia. Farmed tilapia’s omega-3 profile can be be increased through feed supplements including flaxseed, chia and perilla seeds. Tilapia contains essential omega-6 fatty acids, and is rich in vitamins D, B12 and B6. Vitamin B12 is crucial for nervous system function, B6 helps the body to metabolize fats and proteins while vitamin D is important for immunity. 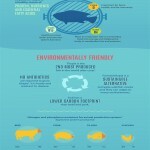 Fish has a lower carbon footprint than red meat. Tilapia shows lower emissions of nitrogen and phosphorus per kilogram protein produced compared to chicken, beef and pork. Tilapia is a hardy fish and does not require the use of antibiotics for growth. WorldFish developed the Genetically Improved Farmed Tilapia (GIFT) strain, which thrives in a wide range of environments. The GIFT strain grows 100% faster than the fish used at the beginning of the breeding program. In Egypt, the Abbassa strain of Nile tilapia, developed by WorldFish, grows 28% faster than the most common commercial strain.